This illustration demonstrates a method used to pass the peritoneal catheter of a VP shunt through the abdominal wall and into the peritoneal cavity through a pathway separate from the fascial and peritoneal opening. 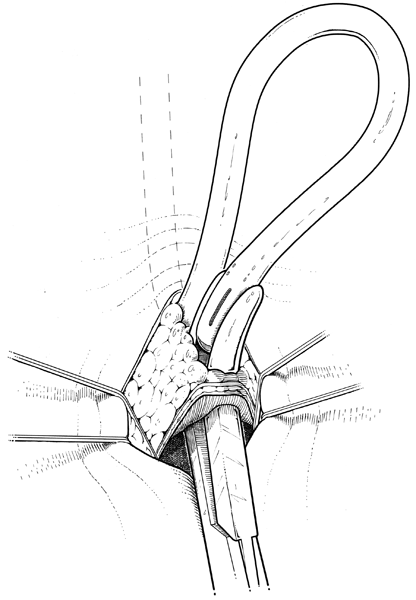 This image shows a method where Dandy forceps are pushed up through the abdominal wall fascia to grab the peritoneal catheter in the subcutaneous tissues and deliver it into the peritoneal cavity. I worked with neurosurgeons to describe a novel technique for passing a peritoneal catheter of a ventriculoperitoneal shunt through the abdominal wall on a path separate from the fascial opening. Elashaal AA, Corrin M & Cusimano MD. 2010. Cerebrospinal fluid shunt insertion: techniques of peritoneal catheter placement separate from abdominal fascial and peritoneal incisions. J Neurosurg. 113(1):79-81.